Many homeowners who see icicles forming on their gutters write them off as a common part of winter. However, they can actually be a sign of a much more serious problem with ice dams. Ice dams can cause major damages to your gutters and roof, and eventually will cause leaks in your roof. Home Solutions Midwest can eliminate ice dams on your home with the Helmet Heat® gutter de-icing system. Helmet Heat® melts ice on the edge of your gutters and ensures your gutters continue to function correctly. If you have problems with ice dams on your home, call us today at or click below to get a free estimate on Helmet Heat® installation. 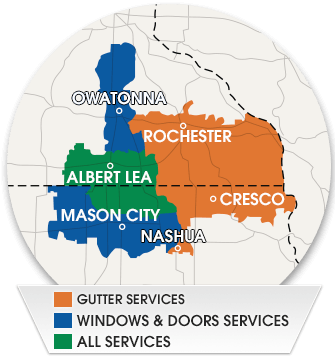 We offer all our services in Rochester, Northfield, Mason City and throughout MN & IA. Ice dams are the product of snow melting and re-freezing on your roof. As warm air escapes your roof, snow melts and the water flows down the roof towards the gutters. However, the eaves and the gutters remain cold because they're not exposed to heat from the inside of the home, so the water freezes again as it reaches these areas. Over the course of a winter, this ice will build up and create a dam, forcing new water back under the shingles of your roof. Eventually, this process will lead to roof leaks while the ice buildup will damage your gutters. Once installed, all you have to do is flip a switch and turn on the system at the recommended times. This will ensure that water flows into your gutters and there is no ice build up on the roof. If you want to eliminate ice dams on your home, Helmet Heat® from Home Solutions Midwest is the solution you need. Our experts will evaluate your home and provide you with a complete installation that keeps your home protected and your gutters working. Call us today at or contact us online to get started on your gutter project. We offer free estimates on all our work in Rochester, Northfield, Mason City, Owatonna, Winona, Faribault, Austin, Northfield, Albert Lea, Farmington and throughout the surrounding areas in Minnesota and Iowa.